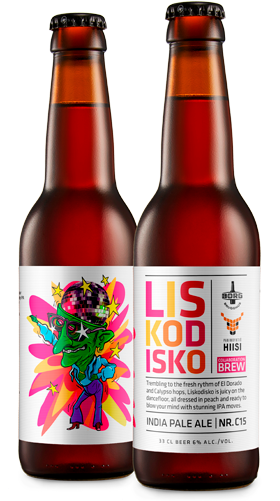 Trembling to the fresh rythm of El Dorado and Calypso hops, Liskodisko is juicy on the dancefloor, all dressed in peach and ready to blow your mind with stunning IPA moves. Liskodisko is conceived in collaboration with our friends at Panimo Hiisi in Finland. This IPA is brewed with delicious peaches to make your summer as juicy as possible. Check out the legendary Icelandic cartoonist Halldór Baldursson's illustration to see what we were thinking.